Outer Banks Power Outage Over As Ocracoke And Hatteras Regain Electricity : The Two-Way Evacuation orders will be lifted at noon Friday for Ocracoke and Hatteras, where electricity was cut off by a construction accident July 27. That meant no air conditioning and no restaurants. 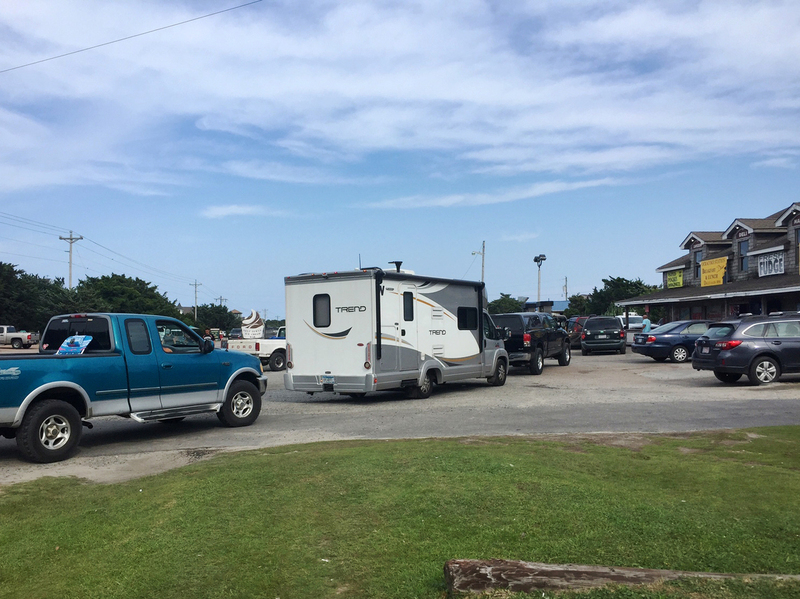 Visitors had to leave Ocracoke Island, lining up at this gas station as they set off, when electricity was cut off on July 27. Evacuation orders for the North Carolina holiday spot are lifted as of noon Friday, along with those for Hatteras Island, now that power has been restored. Visitors on two popular Outer Banks vacation spots had to abandon their holiday plans after a July 27 construction accident that severed the electricity supply to Ocracoke and Hatteras islands in North Carolina. But now Dare and Hyde Counties say the damage has been fixed and the lights are on, and evacuation orders will be lifted as of noon Friday. Visitor accommodations had to be closed while the electricity was off. Generators proved inadequate, the heat and humidity were oppressive with no air conditioning, and restaurants couldn't operate. Officials had feared that repairs would take much longer — weeks perhaps — which would have been devastating to business owners who depend on the summer season for their livelihoods. As we reported, the revenue lost while the islands were closed to tourists can't be recaptured.
" 'You've got waiters and waitresses who are losing tip money. You've got restaurants who aren't selling meals. You've got hotel owners who aren't selling rooms. You've got boat captains who don't have charters,' [North Carolina Gov. Roy] Cooper said.
" 'I do know we're talking hundreds of millions of dollars for our tourism on these islands every year,' the governor said at a news conference on Monday. 'And so it is critically important that we get the power back on, to make sure these tourists and visitors can get back on the island as quickly as possible.' "
The Associated Press quotes officials as saying that about 5,000 residents remained on Hatteras Island despite the evacuation orders, as did 900 residents on Ocracoke Island. The AP notes that other places in the Outer Banks, such as Kitty Hawk and Nags Head, were unaffected by the power outage and stayed open. ACL Construction has acknowledged that, while building a new bridge across the Oregon Inlet, its workers drove a steel casing through a major underground transmission cable belonging to the Cape Hatteras Electric Cooperative.